Well, here we are! We are finally settled although the garage is still full. We didn't have time to unpack a ton before Eric had to go, so we just have the basics. The last couple weeks have made me realize how much "stuff" we don't really need. I have discovered that this is my time to truly simplify. There is so much out there to really clutter our lives, and when it comes right down to it, none of it really matters. When I think of little houses, I think of this song. It makes me happy! Sue would smile and say: "This place is pretty small. Were makin' plans, for Jack and Jill. Well, Sue would smile and say: "This place is really, really small. And whisper in each other's ears: "You know you were right. Yeah, love grows best, in houses just like this. Since I am constantly researching this topic, and I have a strong passion about reading, and books (especially kids books), I thought I would share! These are amazing tips to help anyone encourage reading in their home! 1. Set aside a regular time to read to your children every day. Studies show that regularly reading out loud to children will produce significant gains in reading comprehension, vocabulary, and the decoding of words. Whether your children are preschoolers or preteens, it will increase their desire to read independently. 2. Surround your children with reading material. Children with a large array of reading materials in their homes score higher on standardized tests. Tempt your kids to read by having a large supply of appealing books and magazines at their reading level. Put the reading materials in cars, bathrooms, bedrooms, family rooms, and even by the TV. 3. Have a family reading time. Establish a daily 15 to 30 minute time when everyone in the family reads together silently. Seeing you read will inspire your children to read. Just 15 minutes of daily practice is sufficient to increase their reading fluency. 4. Encourage a wide variety of reading activities. Make reading an integral part of your children's lives. Have them read menus, roadside signs, game directions, weather reports, movie time listings, and other practical everyday information. Also, make sure they always have something to read in their spare time when they could be waiting for appointments or riding in a car. 5. Develop the library habit. Entice your children to read more by taking them to the library every few weeks to get new reading materials. The library also offers reading programs for children of all ages that may appeal to your children and further increase their interest in reading. 6. Be knowledgeable about your children's progress. Find out what reading skills they are expected to have at each grade level. The school's curriculum will give you this information. Track their progress in acquiring basic reading skills on report cards and standardized tests. 7. Look for reading problems. Teachers do not always detect children's reading problems until they've become serious. Find out if your children can sound out words, know sight words, use context to identify unknown words, and clearly understand what they read. 8. Get help promptly for reading problems. Reading problems do not magically disappear with time. The earlier children receive help, the more likely they will become good readers. Make sure your children receive necessary help from teachers, tutors, or learning centers as soon as you discover a problem. 9. Use a variety of aids to help your children. To help your children improve their reading, use textbooks, computer programs, books-on-tape, and other materials available in stores. Games are especially good choices because they let children have fun as they work on their skills. 10. Show enthusiasm for your children's reading. Your reaction has a great influence on how hard they will try to become good readers. Be sure to give them genuine praise for their efforts. Need more variety in your home library? Usborne offers books for all ages! Check out my website above. Cade needed a haircut really bad, and the girls (and me) were wanting to get a cute summer cut! I finally took them in yesterday to all get their new "do". They immediately went out to play when we got home so they could go show all their friends, so this is later in the afternoon. Still very cute, and MUCH easier to take care of! Here is a couple of Jaida. She wanted it flipped up today. She kept laughing and being silly, so I was having a hard time getting a true smile. "Bangor is frequently the last American soil our troops set foot on before going over seas and the first American soil our troops set foot on when returning to the United States. MAINETROOPGREETERS.COM was established as a domestic non-profit to provide a humble thank you to our troops for their sacrifices and those of their families. To date almost 900,000 troops have passed through Bangor making Mainetroopgreeters.com and American Legion Post 200 efforts formidable." Today was the day I had been dreading for some time now. I don't know how these women do it for 3 to 4 times longer than I have too. It is the life of a military wife, and I guess you get used to it. We had to arrive at the airport by 5:00 a.m. The plane was leaving at 7:00 a.m. They were able to get special permission for us to go straight through to the gate, so that was really nice. I was able to linger clear until take-off. Here is Eric checking his monster of a bag. It was big and huge, and so HEAVY! 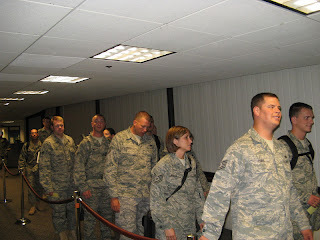 It is truly a good thing that they waive overweight baggage fees for the military. Everyone kind of standing around. Waiting until each one was checked in and ready. We had one of the guys take our picture while we had the chance. While I liked the picture, I was smiling a little too much considering the circumstances. Someone was joking with Eric though so I started laughing, and I was caught with a big cheesy grin. Here is the group of them. Several of them went on the deployment to the same place last time too (almost exactly 6 years ago), so things will be fairly the same. Time to stand in line and board. Here is the plane they are flying on. It was a Boeing 737. Heading down the runway to turn around. Sorry for the play by play. I was a little camera happy, and knew my kids would love to see every detail. Good luck sweetie! We will all miss you! 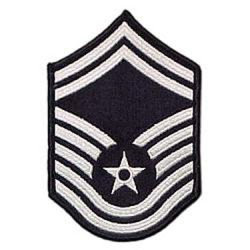 My hubbie passed his 5th and final test for rank advancement yesterday!! I am so happy & proud of him. Those are some pretty tough tests, and I don't know anyone who loves taking tests. He has to wait until his Senior retires (should be after the first of the year), and then he will replace her as SENIOR MASTER SERGEANT!!!! 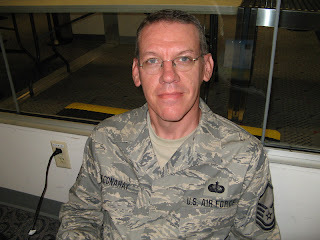 If any of you know Air Force, it is not an easy task to obtain this. This should all happen this fall/winter in between deployments, but he is now next up for sure!!! When it happens I am sure they will have an official "ceremony" type event. When they do, you can bet I will post those pics for sure, but the hard part is over!!! !